Vampire Girls. . Wallpaper and background images in the 뱀파이어 club. "that is a lesbo pic" with a crying symbol? If you aren't serious- please don't joke like that. If you are serious- you're a homophobe. to lesbo for me yo.lol.i love rhymes. Yeah, what is wrong with lesbians? 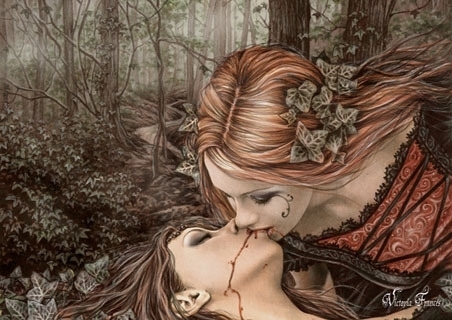 Or does everyone else think this is only a pic of lesbian girls and not vampire girls? If you think that, then why is there blood coming out of the one girl's mouth? I say VAMPIRE pic, not just a lesbian pic! whoever made that is a wonderful artist! I think it is very beautiful Idonnot think it is about les. in our country people rarely talk about les. but most girls are into this topic and so do L .I am from China and I like Vampire Diaries Wish to be friends with all you guys .